We recently made a very small but slightly unusual archival acquisition, in the form of a rather unassuming empty envelope. 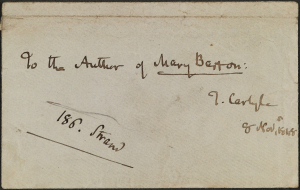 Addressed ‘To the Author of Mary Barton’, it is signed by T. Carlyle and dated 8 November 1848. 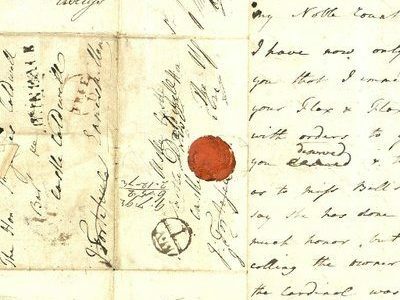 The sender was, of course, the historian and man of letters, Thomas Carlyle, and the intended recipient Elizabeth Gaskell, whose first novel Mary Barton had been published on 25 October that year. The novel powerfully portrayed the lives of the Manchester cotton operatives and was based on Gaskell’s own personal observations of, and acquaintance with, working families in Manchester.